When I was asked to do a follow-up story by Gotcha Equine on my horse Prudence, I was happy to oblige as I have so much to tell from the last time I did a story back in October, 2010. If the results from using the Gotcha Equine supplements were positive back then after some months of use, they are even more evident now ten months later. Her coat is AMAZING! I always get stopped and asked if she is clipped (which she is not), and she gets comments on how shiny and soft her coat is. I have also noticed her summer coat which is nearly through, is a much richer and darker shade of chestnut. There have been many cases of mud fever this year due to the rain, mud and extra clover in the paddocks. Last year I battled six months to rid Pru of the worst case of mud fever I had ever seen. This year when every other horse was getting it she remained mud fever free. I'm putting it down to the Gotcha Equine supplements, as there is no other change in her feed or conditions to explain this. She is not herd bound any more. I can take her away from her mates and she is quite accepting of this and just waits calmly until she gets put back next to them. The man I use who does chiropractor work on her has found less and less issues with her when he comes to see her. There is hardly any tension in her muscles and she is building up nicely in the right places according to him. She is a much calmer and happier horse. The spooking has reduced to almost nothing, and when something does set her off (like the model aeroplanes performing their manoeuvres during my dressage test at Upper Yarra), I can keep riding her and try and get her attention back. Once upon a time I would have got off and taken her home. The fact that she is so much more willing and forward, has allowed me to do things I never thought I would do on her. We are now jumping, and even though I am a very inexperienced jumper, she has taken care of me and forgiven me for the unintentional knocks and jabs. Once upon a time she would have just humped me off, as she was very sensitive. I am now able to work her confidently in a warm-up arena with other horses. There was a time when I had to dismount if there were more than two horses on the arena and if one was having a buck or spook, well that set her off also. The worst thing she does now is put her ears back and squeal. She is a mare! 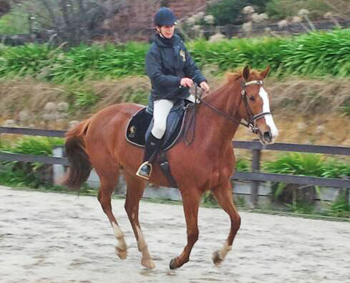 Her canter is improving all the time. I originally had many problems with this gait. She was even humpy and stiff cantering on the lunge. Now we are at the point where she can canter without too much fuss and her transitions are starting to get softer and softer. 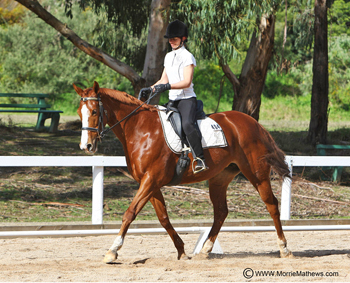 Once upon a time the transitions were non-existent and I did not even have a stop after the canter. This one is still a work in progress, but the fact there has been much improvement since October is very positive. She has shown no signs of grass fever. Autumn was effortless. She was as calm and as happy as a normal season. When other horses were being affected by the changes in pasture, her brain stayed quite even. And let me tell you, with our high voltage pastures, I always had problems with this prior to using the Gotcha Equine supplements. I look forward to riding her during spring as I know there will be no issues! She has held her weight (could possibly lose some kgs) well throughout the dry summer and winter months. I am feeding her a much simpler feed (and less) than what I was before using the Gotcha Equine supplements, and she has not lost condition, energy or that show horse gleam! My biggest buzz happened last week though. Something I had wanted to do, but was scared to do because I did not trust my horse. I wanted to ride Prudence up and down the 'Killer Hills' in Macclesfield which are well known to the locals. There are two hills which are like a big dipper and go on for a kilometer or so. Even though I ride Pru on the trails locally, we stick to pretty much the same routes, so I was not sure how she would be on an unfamiliar trail. As it turns out, a friend of mine Gavin (who is a seasoned trail rider) decided he was going to help me achieve my goal. So last Friday, I not only rode the Killer Hills, I also did the water crossing which had water that went above the horses' knees, the downwards cross country trail and passed numerous yapping dogs who were running up and down fence lines (something which Pru hates). All this, without a single issue. I was so happy, elated, and best of all my horse was calm and relaxed and seemed to be enjoying herself. There was no sign of taking off or spooking By the time you read this, I am hoping to have been for a ride in the Bunyip Forest. I have no doubt that the training I have done with Prudence both on the ground and under saddle has also helped her be more confident and relaxed. My mental attitude has also changed enormously. This could not have happened though if Pru did not give me a feeling of trust and confidence. This I believe she has got from the Gotcha Equine supplements. Thankyou Gotcha Equine for giving me the best horse I have ever had! Something which Harry Whitney told me a couple of years ago, and it's now proving to be true. Des Miller - Légèreté Equestrian Inc.